This Art 101 series of packages on how to use various media -- oils, pastels, watercolors, etc. Nothing very complex, obviously, judging by the size of the boxes and the fact that they're being sold in a Target endcap. 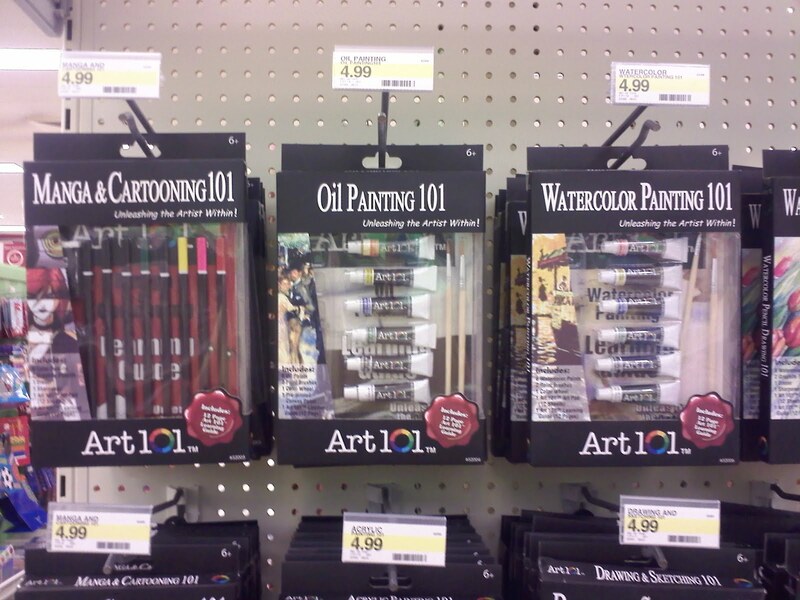 But they are clearly labeled as "Art 101" and thus they're implied to be pretty introductory lessons. But that first one on the shelf, "Manga Cartooning", seems distinctly out of place with the others. Even checking against the cross-sell promotions on the back of the boxes, it was the only one teaching a very specific style within a broader medium, compared to teaching a medium in and of itself. I'm left wondering what exactly they were thinking. Cashing in popularity seems a little bit of stretch because if you were doing that, why bother with all of those formats? And how would manga be that different from the course on drawing?